Categories: Face Care, Men Face Care. Shaving the defense, welfare and education budget is one thing, but what about the more serious issue of shaving your chin? massage a small amount of gel onto wet bristles. always shave in the direction of hair growth and rinse with cold water. we promise you’ll look like a male model. oh, come on, if politicians can lie and get away with it, we can. Manatomicals Shave Gel No More Cuts. 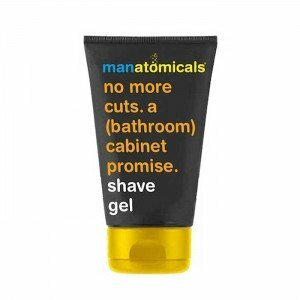 A (Bathroom) Cabinet Promise is a brilliant shave gel designed to help you get that close shave the ladies crave. Comes in a quirky, amusing packaging, this shave gel will leave you feeling refreshed, cleansed and revitalised. Helps avoid irritations such as razor burn. Are you man enough for Manatomicals? The only close shave that you’ll experience with this cabinet member is the one that will get you looking mighty fine for a night out on the lash with your mates. With the guarantee of super-smooth, no-nick, fuzz-free skin this super shave gel is certain to deliver its manifesto promise of no more cuts (for your face that is). A cabinet member that keeps its promise. Who knew. Manatomicals by Anatomicals is the new range of skin and body care products designed specifically for Men. Saving the men from girly products, Manatomicals are top quality products for top quality blokes at affordable prices. Are you man enough for Manatomicals?